The names Meiman…Tristan Meiman. Yeah I suppose that doesn’t roll off the tongue as well as James Bond, plus I’m not a member of MI6 but working for Pure Nintendo does have the same advantages. This title is something else my fellow gamers. 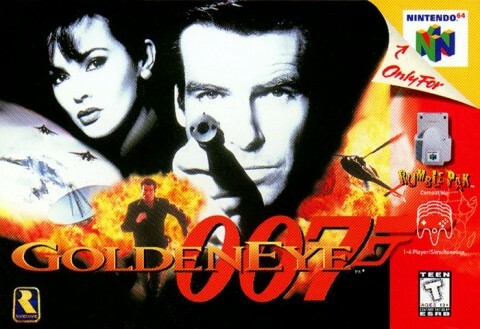 Not only was this game based on the first Bond film that I was exposed to, but its probably one of the few successful games based off a movie that was nothing short of amazing. Not only that, but this game paved the way for what is considered the modern day FPS/multiplayer experience. With that said, lets get this review started and remember, it’s for your eyes only. 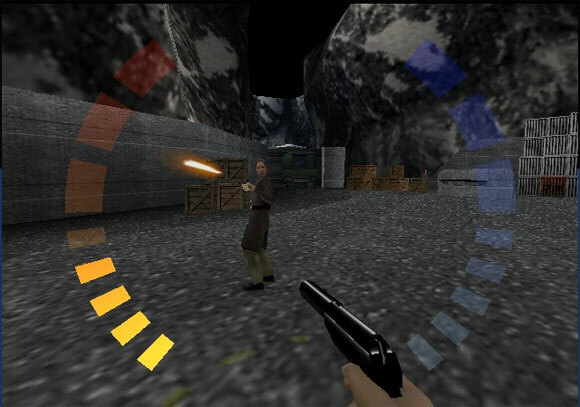 The story of Goldeneye is roughly based on the film itself. I say roughly seeing as though the game would be rather short if it followed the movie to the T. In some cases, this could be potentially damaging to the movie stretching away from its main plot. However, the missions not shown in the movie, feel like something that would have happened, given the movie was written differently. For example, the Statue level has James running about while in the movie, he’s only there for a brief moment and locked in a helicopter. Different, but something you would expect from James bond nonetheless. I really want to avoid discussing the games plot seeing as though I could potentially spoil the movie in case anyone hasn’t seen it yet. The gist of the story is James must save the day and be back in time for tea and biscuits. The Bathroom. They never saw this coming! That is Boris. HE IS INVINCIBLE!!! Don’t be that guy that picks Oddjob…just don’. When it comes to gameplay, it’s pretty simple. See something that isn’t an ally and shoot. Short and sweet. Enemies will come at you from every corner to make sure this spy is KIA and for early AI, they don’t mess around. 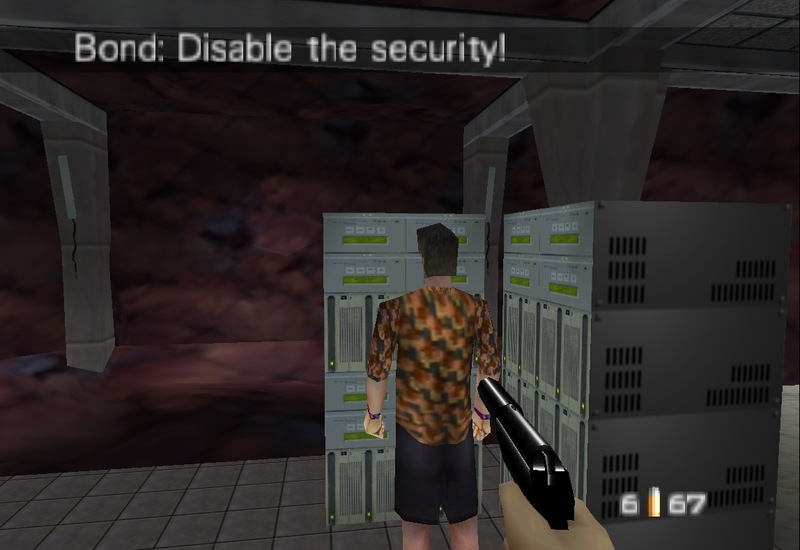 However, your overall experience in Goldeneye can be determined by the choice in difficulty. Theres Agent (easy) Secret Agent (medium) and 00 Agent (hard). The difficulty is not only shown by the amount of enemies that appear, but also the damage you take, extra mission objectives and the strength of bullet proof vests. Believe me when I say this, that 00 Agent difficulty is not to be taken lightly. 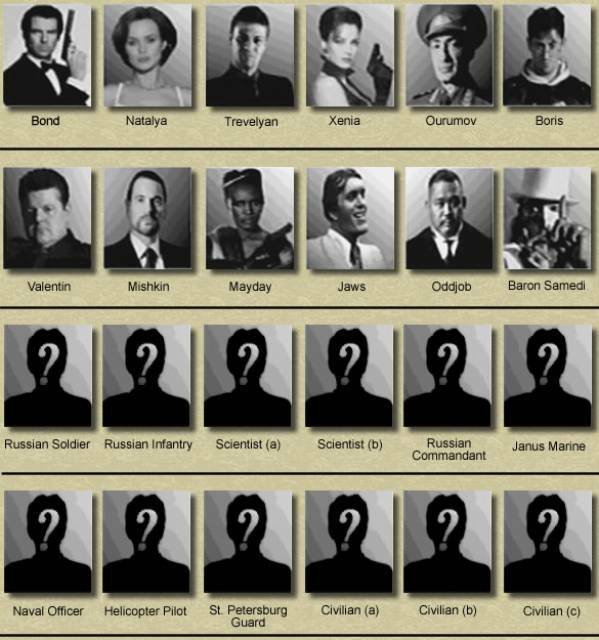 It only seems fitting that the 00 Agent status in the Bond world and in the game are meant for the best of the best. Even moments in Agent difficulty, I found my time to be difficult mainly due to the very cryptic objectives and the friendly AI that seem to think that friendly fire is turned off. I’ve failed a lot of the missions in this game due to the people that I’m supposed to protect get caught in my cross fire. But don’t worry, they can take the enemy bullets no problem. But the second YOUR bullet grazes their big toe, Objective Failed. So word to the wise, try not to get too trigger happy. Game still to difficult for you? Well there’s always the cheat menu! But it comes at a price, for your skills as a gamer will be tested to unlock them. While these cheats can be unlocked via special button combinations, its always sweeter to earn these cheats the proper way. In certain missions, you’ll have to harness your inner speed runner and finish said mission within an allotted time on a specific difficulty. What? You thought they would just hand over invincibility or invisibility? Now its time to move onto one of the most crucial aspects of Goldeneye. For some, its the sole reason why they play video games. Either to bring their friends in on the fun, or to play some random people that chances are, they’ll never meet in person. 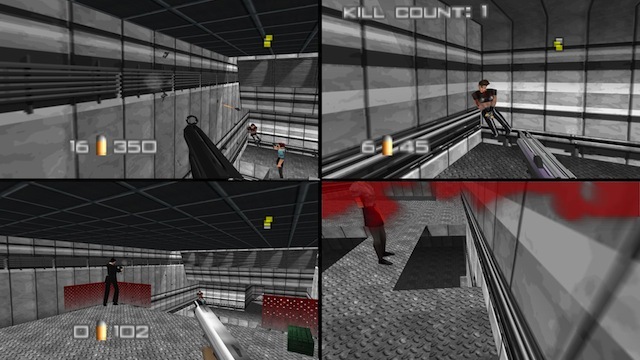 Now for you youngsters out there, Goldeneye multiplayer is what we call “local multiplayer”. Before your fancy internet became incorporated in the world of gaming, you would actually have to go interact with other people, gather round one TV and figure out who was screen watching and who wasn’t. These were joyous times as friends would come together, stay up all night, trash talk and overall have a fun time. Much like how the gameplay set the stage for future FPS’s, the multiplayer was the topping of the cake. However, this was a risky move at the time. This was something completely different for the gaming world. Looking back on past consoles, there really wasn’t a lot of multiplayer gaming and when it did, there were only two people on the screen. This added complete and unexpected and dare I say beautiful chaos! Everyone started at random points of the map only aided by their radar (which I swear never helped me when I played) and when you saw another person, you held your finger down on the Z trigger until your clip was empty, and if you’re like me, missed your target completely. Sure you may have died multiple times, but you had fun doing it. So many laughs shared, so many memories that stayed in your gaming heart to this day. Rare was on the cusp of something fantastic and it would be remembered for the years to come. 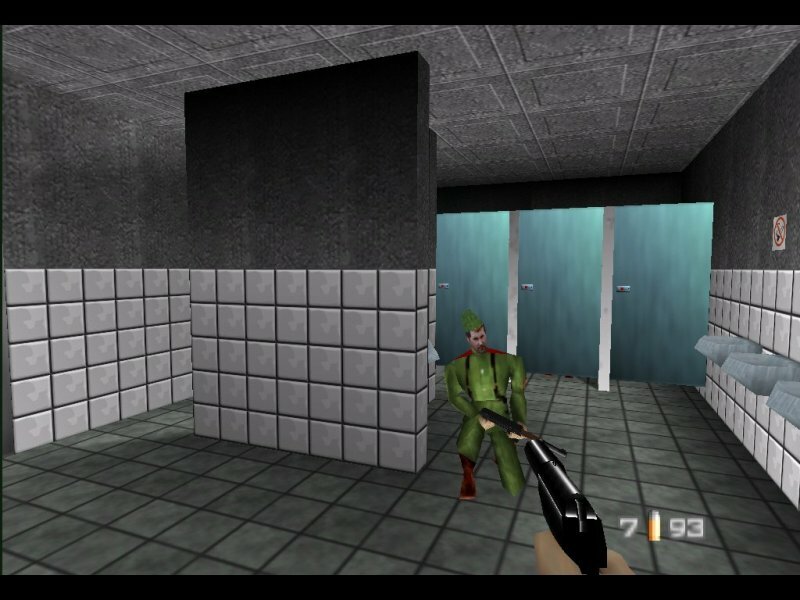 So how does Goldeneye hold up today? Well, for its point polygon graphics, slightly unpredictable AI, revolutionary gameplay and free liberty to the movies plot? Very well actually. In fact, its something that belongs in every ones collection Nintendo fan or not. This is not only a historic game in the industry, but a classic game overall. To this day, I still pop in this beloved cartridge to play its multiplayer with friends over the latests FPS. Sometimes you just gotta go back to your roots. Now I would finish off this review with the traditional Bond action of “burn after reading”. But I don’t want to be responsible for the destruction of your laptop, phone and or tablet device.